← The Oscar Nominations LIVE! WATCH HERE! Benedict Cumberbatch “knocked for six” By His First Oscar Nomination! (Los Angeles) Nominations for the 87th Annual Academy Awards were announced live from Hollywood at 5:30AM this morning and amongst the Best Actor in a Leading Role nominees was Benedict Cumberbatch for his stirring portrayal of British enigma code breaker, Alan Turing in The Imitation Game. If that doesn’t bring a tear to your eye, nothing will. What a beautiful sentiment! And I’m sure the pride will be just as full on his parents side as well. Benedict’s parents, Timothy Carlton and Wanda Ventham, have both enjoyed impressive careers in their own right. 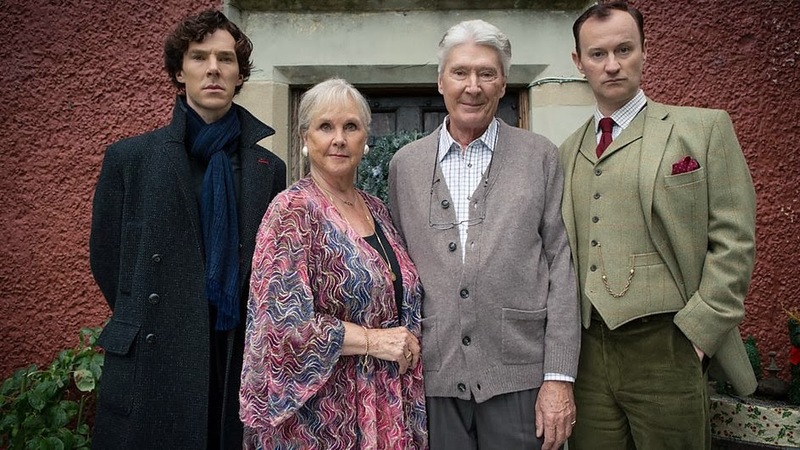 Most recently, they thrilled Sherlock fans by appearing on the show as Sherlock’s parents! The Best Actor nomination has come as no surprise to us, however, as Benedict has been receiving rave reviews and critical acclaim for his brilliant work in Imitation Game since its release, picking up accolades and awards all along the way. Benedict Cumberbatch has much to be celebrate this year! With a hit movie, his engagement to fiancée Sophie Hunter, impending fatherhood, and now add an Academy Award nominee to the list. Indeed, there is much to toast in the Cumberbatch household and we would like to join in that toast by offering our congratulations to Benedict on his well deserved nomination! Lady Anglophile….picking out my red carpet frock as we speak! This entry was posted in Lady Anglophile Reviews & Other Bits and Bobs, The CumberWatch and tagged Academy Awards, Benedict Cumberbatch, Oscar Nominations, Oscars, Sherlock. Bookmark the permalink. 1 Response to Benedict Cumberbatch “knocked for six” By His First Oscar Nomination!